Sometimes you have a number of machines where the LT agent gets stuck in an “executing” state. When this happens the only thing the machine will do is check in to the LT server. Solution is a reboot or restart of the LT service. Stalled Agents plugin helps identify and allows you to repair these agents when this happens. Plugins4Labtech has created a new plugin for LabTech that is easily installed into the LabTech RMM platform (Connectwise Automate). This plugin finds and lists systems with executing commands and shows you how many each agent has currently running. Agents with excessively high numbers are more likely stalled (not responding to commands). Typically you would need to cancel the executing commands and restart the LabTech agent services to resolve. 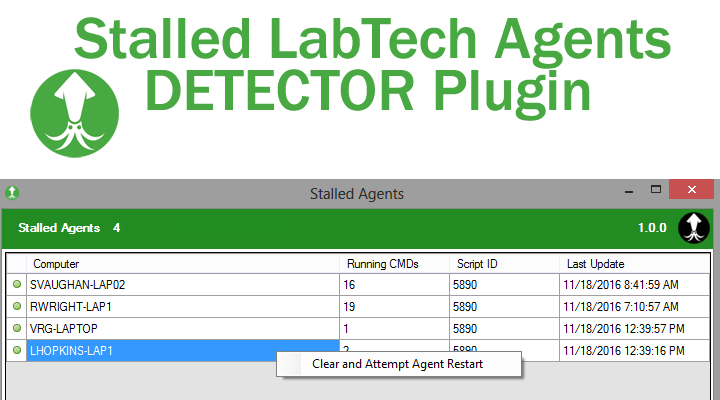 If the agent is not processing all the other commands it will not process a restart agent command. The only methods are to have local user restart service which is very manual and time intensive. This also shows you have a whole in your coverage if local users are needed to manage system. The next option is to try some remote control access which is very manual and time consuming. We have a better idea! Our plugin has 2 options to handle this remotely, the first is using RPC from one agent to another to kill and restart the agent and the second is to use RMM+ for ScreenConnect to issue remote commands bypassing the LT agent. I’m new to LabTech, so I apologize if I’m asking something really basic. That said, is there any way to offer this as an XML file that can be imported as an LT XML Expansion? I ask because that is the only option I have for adding anything to my hosted Labtech environment. I am unable to add any third party plugins other than what is offered by default.